Generic Description: Class C Motorhomes are larger than an Class B vehicle with an obvious overhang over the front driving area. Typically, it will be 21’ to 37’ in length. The bodies are all attached to Heavy Duty Truck chassis and engine assemblies. They will have either a Gasoline or Diesel Engine – always front mounted. Some manufacturers do not allow access from the driving area to the back – some do. The newer it is, the more aerodynamic it will be. 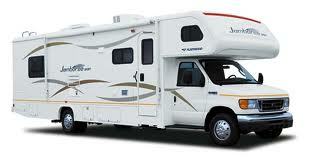 The Class C Motorhome is a great way to rent a RV. **Basic - HD Truck Chassis/Engine - without the body – usually a Gasoline Engine System. **Exclusive/Custom brand - This manufacturer will purchase and assemble a RV Class C to an “Over the Road” type Heavy Duty Truck Assembly. This “Over the Road” vehicle will be a full diesel configuration with air bags, air brakes, etc. Be sure to compare the different weight limits per manufacturer, on a standardized sticker, probably in the RV section of the Body. BODY: This will vary considerably! It could be a very basic exterior with an obvious overhang over the cab area to an extremely custom aerodynamic appearance. Usually, the gas is a plainer version of the diesel. Each manufacturer makes a cage type “box” for the RV section and then attaches that to the HD Truck Chassis. Slideout rooms are more common on the new ones. Engines: These could be either Gas or Diesel. However, they will always be a HD version, due to overall length, weight and amenities available. The emission controls on the new diesel engines require careful consideration before selecting the brand engine. There are very important differences between manufacturers for the customer to consider regards how emissions are handled and maintained, some even requiring an additional purchase of a DEF liquid to conform to EPA standards! Before we get too far - let's take a look at a really cool "Class C" RV! At first I thought it was a different Class, but no - it's a really awesome Class C.
Amenities: The sky can be the limit here – depending on the engine/chassis selection. The “Over the Road” vehicle can handle anything. The Gas system will be restricted. Diesel will have an air compressor – therefore an air bag ride quality is available, air leveling systems, etc. The diesel will handle larger storage utility tanks and therefore capable of larger/nicer amenities inside – 4 door refrigerator, 3 burner gas stove, special countertops, King Bed, custom bathrooms, etc. A gas configuration will certainly allow wonderful amenities – just not quite so “luxurious”! Utilities: Gas will certainly have plenty of utility storage capacity. However, a diesel can have so much more. Depending on the lifestyle you are choosing, will determine how important utility storage capacity is. Since a Class C Motorhome is a common “Fulltime” self contained vehicle, storage becomes more important – especially if you like to wander off the highways and enjoy boondocking. They may have a solar panel standard; it will have a smaller generator installed as standard. Again, a diesel will be easier to upgrade to your desires. Accessories: The usual items are standard – TV’s, stereos, basic refrigerators, stovetops, manual awnings, etc. If you are the type that needs/wants all the luxuries of a “house”, than the gas model will suffice, but restrict your “luxuries” available to you. The diesel configuration will allow pretty much any custom items that you must have! Pros: Easier than a Class A to drive, maneuver and park, city friendly, can be cheaper to maintain (gas version); diesel will have air brakes, suspension, leveling, engine braking, etc. ; Can be very luxurious; Can be driven off main roads for boondocking - carefully! ; great vacation vehicle as a rent a motorhome or RV trial itself! Cons: a little “small” to fulltime; gas engines can be underpowered. Be sure to look at motorhome reviews before purchasing any Class C motorhomes.